The company is also a sponsor of San Francisco Pride, scheduled for June 24-25, as it has been for the past three years. Other sponsors include Amazon, Facebook, Google, Apple, the Walt Disney Company, Whole Foods, Starbucks, Chipotle, TMobile, Bank of America, CVS, Macy’s, State Farm, and Smirnoff. “As an official sponsor of this year’s pride festivities, we looked for a unique way to bring that celebration into our restaurants throughout the Greater Bay Area,” Knapp said of the fry boxes. “The rainbow fry boxes are a fun way to show our support of the LGBTQ community using one of McDonald’s most iconic and recognizable items,” Cathy Martin, co-chair of the McDonald’s PRIDE Network and vice president of McDonald’s Baltimore Washington Region, said in a statement. Knapp noted to reporters that the fast food chain has been a proponent of homosexual causes for quite some time. “With a long history of supporting diversity and inclusion of its employees, McDonald’s began offering domestic partner benefits in 2004, and has also scored 100 for the past two years in the Human Rights Campaign Corporate Equality Index (HRC CEI),” she said. The company also added “sexual orientation” to its nondiscrimination policy in 1999, and founded the PRIDE network in 2005. 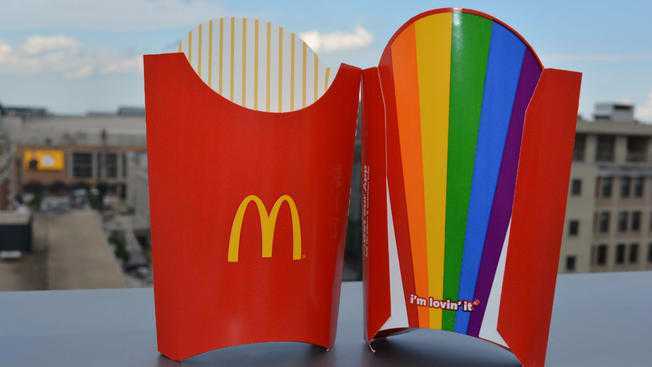 Word that McDonald’s is now making a statement with its rainbow fry boxes has generated applause from some, while others have called for a boycott of the fast food chain. “I will not use McDonald’s anymore now that I know this. I don’t want my money financing that, not one penny,” one commenter wrote. “So many businesses to boycott. Where will a true Christian go to purchase goods and services?” another asked.